This media resources page provides members of the media with information; resources; and broadcast-, print-, and web-quality imagery developed during the 2017 Laulima O Ka Moana: Exploring Deep Monument Waters Around Johnston Atoll expedition. From July 7 - August 2, NOAA and partners will conduct an ocean exploration expedition on NOAA Ship Okeanos Explorer to collect critical baseline information about unknown and poorly known deepwater areas of the Johnston Atoll Unit of the Pacific Remote Islands Marine National Monument (PRIMNM). The expedition begins and ends in Honolulu, Hawaii. During the expedition, our at-sea and shore-based science teams will work together to map the seafloor and make deepwater scientific observations in these areas, building upon our previous exploration work in the area in 2015. Live video of remotely operated vehicle (ROV) dives can be viewed online in real time from July 13 or 14 to July 29, 2017. The team will conduct 24-hour operations consisting of daytime ROV dives and overnight mapping operations, including during transit. Mapping and ROV dives with high-resolution visual surveys and limited sampling activities will focus on priority dive sites and mapping areas in and around the Johnston Atoll Unit. Dive sites are expected to include deep-sea coral and sponge habitats and seamounts. This expedition will contribute to foundational information in the region to catalyze further exploration, research, and management activities. The Johnston Atoll Unit of the Pacific Remote Islands Marine National Monument (PRIMNM) is located south of Hawaii. More than 99% of the Johnston Atoll Unit is deep water and despite some previous work, much remains unknown. Increasing baseline knowledge of ocean habitats is critical to inform the management of these remarkable ecosystems. Only recently have scientists visited the deep waters of the Monument, where they observed previously unknown biological, chemical, and geological wonders of nature. As part of CAPSTONE, Okeanos Explorer has conducted expeditions in and around other Units of PRIMNM, including the Wake Island Unit, the Howland and Baker Unit, and the Jarvis Island, Palmyra Atoll, and Kingman Reef. This expedition will build upon NOAA's previous exploration work in the Johnston Atoll Unit in 2015. This expedition is part of the three-year Campaign to Address the Pacific monument Science, Technology, and Ocean NEeds (CAPSTONE), a foundational science initiative to collect deepwater baseline information to support science and management decisions in and around U.S. marine protected areas in the central and western Pacific. Other 2017 focus areas include National Marine Sanctuary of American Samoa, Rose Atoll Marine National Monument, Musicians Seamounts, and the Howland and Baker and Kingman Reef and Palmyra Atoll Units of the Pacific Remote Islands Marine National Monument. Dr. Christopher Kelley is serving as the science lead for the three-year CAPSTONE project in the Pacific. He has been the program biologist for the Hawaii Undersea Research Laboratory (HURL) at the University of Hawaii for the last 17 years. His core responsibilities have included the identification of deepwater fish and invertebrates recorded during submersible and remotely operated vehicle (ROV) operations and the extraction of video annotations for inclusion in HURL’s deepwater animal database and online photo guide. Chris is also graduate faculty for the Department of Oceanography, serving on both masters and PhD graduate student committees. In addition to his core responsibilities, Chris has both the lead for and worked on numerous external grants from federal and state agencies. Some projects have focused on the deepwater bottomfish fishery, involving the review of Essential Fish Habitat (EFH) designations in Hawaii and elsewhere in the Pacific; examining the impacts of bottom fishing; and evaluating the effectiveness of bottomfish reserves. Other projects have involved the description of the deepwater communities living on manganese crusts in the Central Pacific and describing the deepwater biological communities associated with disposed munitions off Pearl Harbor. Chris has also lead a significant number of multibeam and sidescan sonar mapping projects throughout the Hawaiian archipelago, the latest of which involved 72 days of mapping in the Papahanaumokuakea Marine National Monument on board the R/V Falkor. His sidescan sonar towfish surveys off Oahu have led to the discovery of a number of submerged cultural resources, the most significant of which was the Japanese mini sub sunk by the U.S. destroyer Ward moments before the 1941 attack on Pearl Harbor. He has been contracted to create various types of GIS projects and recently completed the first multibeam backscatter synthesis of the entire seafloor surrounding the Main Hawaiian Islands. Dr. Kelley received his PhD in 1995 from the University of Hawaii while researching fish reproductive cycles. Prior to joining HURL, he traveled extensively, providing technical assistance for developing fish hatcheries in Indonesia, Taiwan, the Philippines, Egypt, and Cameroon, West Africa. He was also an aquanaut for the Hydrolab Undersea Habitat in 1982, assisting in a study on the ecology and social behavior of Caribbean angelfishes. 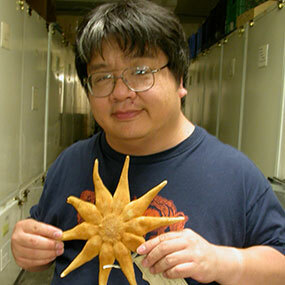 Chris Mah studies the biology, evolution, and diversity of sea stars (also called starfish or asteroids). This includes identifying and describing new species, understanding their relationships to other starfishes, and studying adaptations of starfish species to their environment, especially those in the deep sea. He has described over 30 new species, including half a dozen new genera and a new family of deep-sea starfishes. He is broadly knowledgeable about echinoderms (spiny skinned relatives of sea stars) and many other deep-sea animals. Dr. Mah has studied sea stars throughout the world, including Japan, Australia, New Zealand, Antarctica, and South Africa. Deep-sea research is also one of his primary research topics and his studies have taken him on two submersible dives (Atlantic and Pacific) as well as research cruises in the North Pacific and the Atlantic. Although he has participated in Okeanos Explorer cruises as a shoreside expert, this will be his first time onboard as a biology co-lead. He has a BS in Zoology from Humboldt State University, a Masters in Marine Biology from San Francisco State University (in cooperation with the California Academy of Sciences), and a PhD in Geology (Paleontology) from the University of Illinois at Urbana-Champaign. Chris grew up as a ‘natural history nerd’ looking for beetles and salamanders in his home town of San Francisco, California, eventually finding like-minded folk at the California Academy of Sciences and other natural history museums. This and a healthy diet of science fiction movies and comic books has let to his infatuation with studying the weird evolutionary adaptations of some of the strangest animals on the planet. Chris writes the Echinoblog (http://echinoblog.blogspot.com/ ), a blog about echinoderms (sea stars, sea urchins and their relatives) and other strange invertebrates. He tweets about these things on Twitter: @echinoblog . 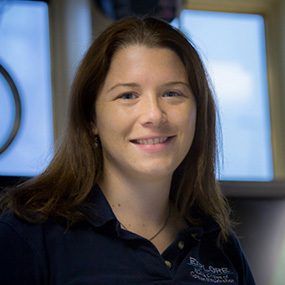 Kelley Elliott is the Senior Expedition Manager for NOAA's Office of Ocean Exploration and Research. She holds a master's degree in maritime archaeology from the University of Southampton and a bachelor's degree in environmental conservation from George Mason University. Ms. Elliott is responsible for planning, coordinating, and managing expeditions conducted by NOAA Ship Okeanos Explorer. She has coordinated a dozen Okeanos expeditions since 2009, including eight that have pushed the frontiers of shore-based participation via telepresence. Over the last decade, her combined professional and academic field experiences have taken her around the globe to investigate a diversity of science topics from Arctic Ocean ecology, tropical ecosystems, and submerged cultural heritage to deep-sea ecosystems, including hydrothermal vents, gas seeps, submarine canyons, and deep-sea coral habitats. An explorer at heart, Ms. Elliott spends most of her spare time exploring the great outdoors, from the volcanoes of Nicaragua to the trails surrounding her home in Virginia. Mashkoor earned his master's in Ocean Mapping from the University of New Hampshire in 2005. 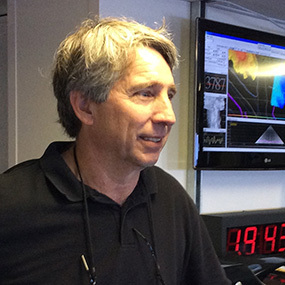 He has been with NOAA since 2008 and served as the onboard mapping lead on the Okeanos Explorer from 2008-2013. From 2013-2015, he worked with the NOAA Office of Coast Survey. 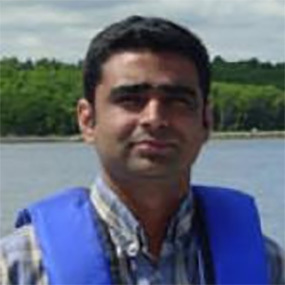 He rejoined OER in July 2015 as a Mapping Team Lead, where he is responsible for the ocean mapping systems onboard NOAA Ship Okeanos Explorer. On shore, Mashkoor works in Silver Spring, Maryland, where he contributes to expeditions through data processing and archiving, operational planning, and mapping product development.